Before joining the newly formed Reach Separations in February 2012, I spent five years at AstraZeneca in analysis and purification (latterly as group lead in reversed phase and chiral purification). This experience gives me a good perspective of both the needs of “big pharma” and, more recently, the needs of a specialist separation solution provider. My time at AstraZeneca allowed me to get “hands on” with a number of chromatography and mass spectrometry platforms, and provided me with an acute awareness of the need for reliable data and robust instrumentation – something that was reinforced when I joined Reach Separations. Reach Separations started out of the blocks very fast, in part because we had the expertise to address enantiomer separation challenges faced by the pharmaceutical industry in light of tighter regulations; indeed, we started out primarily as a chiral chromatography-focused business, serving the pharma market. However, over the last four years, we’ve branched out into agrochemical and fine chemical markets and, as we’ve grown, achiral work has become a much bigger part of our business. At Reach Separations, the ACQUITY QDa is a key addition to the company’s UPLC and UPC2 systems. In addition to our chiral purification work (we tackle everything from mg to kg scale), we offer achiral purification services to produce “ultra pure” material that goes onto later stage testing. We also work with manufacturers at the opposite end of the spectrum, by offering isolation and identification of impurities. When it comes to purification, the most important (and challenging) aspect is the analysis. From a separations standpoint, we use several UPLC systems and we also have an SFC equivalent – the Waters ACQUITY UPC2. Those two separation systems are now coupled with a Waters ACQUITY QDa mass detector and this allows us to cover any project that comes into the laboratory. We’ve had the QDa for 18 months – with only one preventive maintenance done and zero downtime. The investment coincided with a sudden surge in company growth, and the need to expand our mass detection capability. Prior to that, we had been working with legacy single quad mass spec systems that suffered from reliability as well as compatibility issues. The QDa was an obvious fit, ticking several important boxes for our lab. Firstly, it’s competitively priced – any small but fast-growing lab will appreciate this parameter; consequently, return on investment is near unbeatable. Secondly, compatibility with our UPLC and UPC2 systems was assured. Thirdly, because we were growing rapidly, lab space was at a premium, which is where the QDa wins hands down – its small footprint is what makes it feel more like a detector than an MS system, and it fits neatly in with the other modules. Of course, it also needs to be able to do the job – and we wouldn’t invest in a system that gives results that are not comparable to other service providers in our space. Mass data quality from the QDa is excellent for our needs and provides us with 100 percent confidence in all our results. Possibly the biggest plus point for the QDa is its usability. As we ramped up the business, we needed additional staff members. Rather than wasting precious resources on training fresh talent on the nuances of quirky, old MS systems, we could get them up and running with ease. 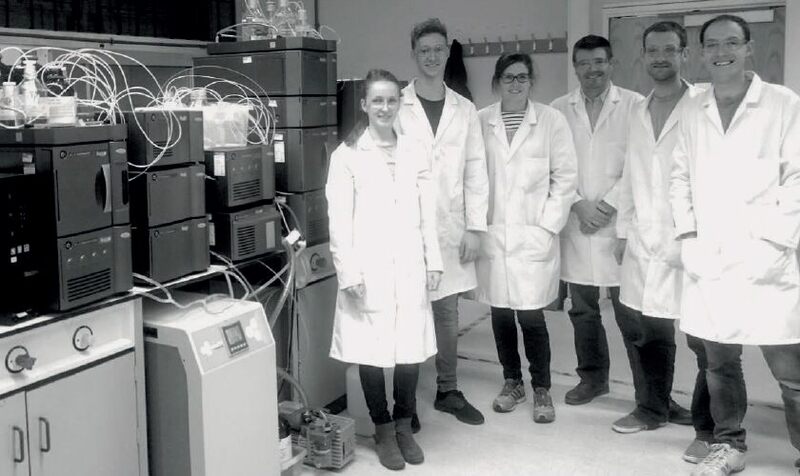 Indeed, the new members of our team were quickly able to apply theoretical knowledge of mass spectrometry to reallife samples, which reflects my opinion that the ACQUITY QDa is one of the most user-friendly pieces of equipment on the market. Even so, if you’re running a team of analysts with different experience levels, it’s great to be able to confidently rely on the ACQUITY QDa’s internal calibration, which significantly reduces the potential for operator error… In a competitive contract environment, getting analyses right first time is essential. Even as an experienced user of mass spectrometry, the ACQUITY QDa’s usability is very welcome. I think it’s the first time I’ve felt that mass detection has truly integrated itself with the rest of the separation workflow. Companies that don’t have mass spectrometry “super users” on staff finally have a way to access quality mass data with confidence. The simple fact that it can be treated like a pump or a UV detector is a real bonus to our team. On the other side of that coin, you do sometimes have to remind yourself that you are looking at mass spectrometry data. An easy to use system needs backing up with easy to use software. Here again, users of the QDa are presented with a software package (Empower 3 Chromatography Data Software) that allows some of the easiest data interpretation I’ve seen – another huge plus. With a focus on usability and affordability, it might be tempting to consider the ACQUITY QDa a plaything, and though it is relatively fun to use, we throw it some serious tasks. For example, we use it for mass confirmation of samples as they enter and leave the lab. We’ve started using it very heavily with the UPC2 system for chiral separation method development. We recently introduced “chiral pooling,” which allows us to analyze as many as six compounds in a single run to assess optimal conditions for separating isomers (1). Without mass data, this would not be possible – we’ve estimated that we are running five times faster (55 samples a day) than if we used conventional, sequential SFC runs with UV detection alone. Any piece of technology that enables higher throughput is always welcome in a service environment. Today, UPLC, UPC2 and QDa mass detection is our frontline analytical platform. Over the next 12 months, as we continue to grow, I can expect to see us scaling up that platform, including several more QDa detectors. We feel it puts us in a great position to serve our customers with top quality but very competitive analytical and purification services. If, like me, you’ve worked with (and been frustrated by) legacy single-quad MS systems in the past, you’ll likely be surprised and delighted in equal measure by the ACQUITY QDa’s simplicity and robustness. If you’re new to mass detection, you’ll have to settle for delighted. Alex Brien is a Senior Purification Scientist at Reach Separations, based at BioCity Nottingham in Nottingham, UK. Originally produced and published by The Analytical Scientist for Waters: Mass Data Made Simple.